State of Disc Golf 2017 – Is Game Play Too Fast? Too Loud? 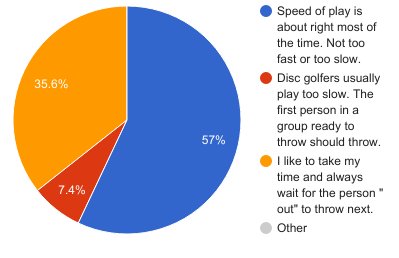 Which statement about speed of play typically applies to you for recreational disc golf rounds? Despite those occasional irritations when it comes to speed of play, the majority 57% of those surveyed felt that the rounds move along at the right pace. But when it comes to those who wish the speed of play were different, it is more about wanting to take their time, rather than wanting to push the pace up a notch. 35.6% of players like to take their time, so if you add together those who are content, and those who like to take their time, you come up with 92.6% who are fine with the way things are or who like to take their time, so apparently it is a vocal minority of 7.4% that wishes things would speed up. The percentage of those who feel the game is too slow was higher when narrowed down to those who called themselves “professional” on the survey, with 12% feeling the game moves too slowly. However, those who called themselves beginners, recreational, intermediate, and even advanced, fell right in line with the majority who are fine with the pace of the game. How important is it that those around you stand still and are silent before you throw? For all the emphasis on being silent during putts or throws, it looks like it is a huge minority that fines the silence to be “very important”– so much so that they won’t throw with a potential distraction. That 7.7% pales in comparison to the 69.2% majority who feels that it is only “somewhat important” and who are not generally bothered by a little noise or movement. That 7.7% also pales in comparison with the 23.1% who feel that silence and movement is “not important”. 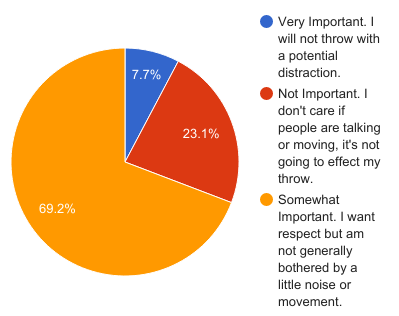 We looked at those who called themselves “professionals” on the survey to see if the competitive nature of their game play makes the distraction factor more or less important. It turns out that 17.1% feel that silence is “very important” and 66.1% feel it is “somewhat important”. That leaves 16.8% feeling it is “not important”. So, to a small professional players find distractions to be a nuisance. In fact, moving through the categories from beginners to advanced, the more advanced the player, the higher percentage that said silence and stillness was important, though never a majority. Which is why disc golfers can’t bowl. My 215 I bowled last month disagrees with you. Intriguing topic for discussion. I find a majority of the touring pro players move quickly. Other factors that effect speed-of-play are how many players are in each group, mixed divisions playing the same course, and course design. Good course design goes a long way to reducing back-ups. I missed this survey, but I personally like to play faster and agree with the majority on the standing still question. I find it odd that majority is not concerned with distraction or movement. Most ALL people Iv played with have waited for movement or noise to stop. I throw where I look. If you draw my attention DUCK!! !